(Upper photo) The first-known example of a mummified lion was found in the tomb of Tutankhamun's wet nurse Maia at Saqqara, Egypt. 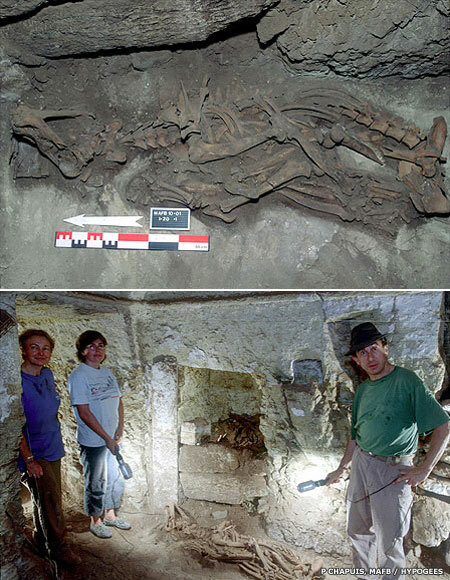 (Lower photo) The archaeologists who discovered the lion stand by the specimen where it was found in the tomb. From left to right: Anaick Samzun, Cecile Callou, and Alain Zivie. Images and text copyright © BBC or affiliates. Reproduction is made on a 'fair dealing' basis for the purpose of disseminating relevant information to a specific audience. No breach of copyright is intended or inferred. Go back or return home.